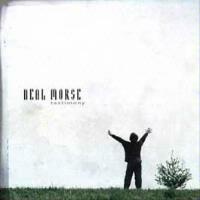 Neal Morse's first post-Spock's Beard album is a big pill to swallow - over two hours' worth of music that document Morse's conversion to Christianity. If you thought that "Snow" was a bit sprawling, this one outdoes it in scope and breadth. But with Morse's knack for flair, it's an amazing 2-CD effort. On top of that, the album is in five parts, so several songs can all segue into each other. Morse plays all keyboards, guitars, and basses - the drums are handled most ably by Mike Portnoy, and ex-Kansas guitarist Kerry Livgren (himself a member of the contemporary Christian music scene) makes an appearance. This preamble is a nice, soft introduction to the album. Morse uses synths, acoustic guitar, and a pedal steel guitar in the arrangement. This piece starts with discordant strings, a la Paul Buckmaster's early work with Elton John, but then kicks into the next number. Neal turns it up a notch on this keyboard-based rocker, but there's a bit of pessimism as he recounts some of the tougher times in his life. The song ends with a recap of the theme from Overture No. 1. Like "The Land of Beginning Again," Morse starts with a gentle route on this number. Glenn Caruba adds light hand percussion - congas, tambourine, and shaker. But then Portnoy comes in with the toms, and the song slowly but gradually builds in tension. This is a short (1:56) instrumental with Morse and Portnoy supplying the muscle. The brief interlude-within-the-Interlude comes from the string section. A basic rocker that describes Neal's battles in life. The Prince, in this case, is whoever it was who was dragging Neal down. This is reminiscent of "I'm the Guy" from the Snow album. Morse has always had a penchant for Latin rhythms, and this song lets him indulge. This song is reminiscent to "The Man Who Would Be King" from Neal's first solo album. Points to Morse as well for rhyming "principalities," "legalities," and "power before" and making it fit. This piece is the first indication of the change in Morse's life and his conscious decision to follow God. As can be expected, the song is slow, and the instrumentation (drums, keyboards, and strings) is toned down a bit to let the message come through. Another typical Morse instrumental with the syncopated sixteenth-note riffs as the foundation. What appears as a straight-forward tune goes into a series of instrumental sections at the end, as though Morse can't figure out which section to use as the segue into the next piece. But he settles on a segment that features Eric Brenton's violin solo. This track bounces out of the gate at near-warp speed. Morse uses the chorus from "Colder in the Sun" and the riff from "Overture no. 1", but this time around he sings that something good was happening. This is an honest look at his struggles in life (hey, nobody said that life was easy), but the song has an uplifting message. The arrangement is again muted to convey the seriousness of the message. You have to like the opening line: "To make the story even longer." (See, Neal? You can laugh about it *now*.) This song is really in four parts - first is the vocal part that include some luscious harmonies on the bridge, then two instrumental parts. The first is Latin-flavored, and the second part has a complicated melody line like "Snow's Night Out", again borrowing from the "Snow" album. The song then ends with a soft, spacey outro. Kerry Livgren trades guitar chops with Neal on this one. This song sounds like mid-80s Genesis with its quiet, almost timid arrangement on the verses where Morse admits to his limitations, and then the big explosion in the middle with a melodic guitar solo. A heavy-hitting, rather dramatic instrumental that is led primarily by the string section, but the piece still rocks. Here Neal discusses his move to his now home of Nashville. His sense of humor is still intact ("The preacher said you're saved by faith and not by works / I thought 'that's good 'cause I haven't worked in a year'"). Against a backdrop of a down-home church service, Neal goes with an acoustic guitar foundation. There's some rather fancy finger-picking, flat-picking, and a fiery violin solo on this country-drenched hoedown. This song sounds quite a bit like the material on his previous two solo albums - good, down-to-earth rock with little flash. Neal borrows a snippet from "Colder in the Sun" in the chorus, and the French Horn gives the song a slight Who feel. This is the "point of no return," as it were, as Neal sings about his decision to turn his life over. Of course, the song takes a slow, stately approach with no real curves or surprises in the arrangement. After a piano intro reminiscent of "The Doorway" from Spock's Beard's Beware of Darkness album, he settles into the first verse, then lets the keyboards take the lead. This song starts off with a Latin feel, and Morse returns to the chorus line from "The Promise." Jim Hoke and Mark Leniger get to trade licks on trumpet and saxophone at one point, and this song gives the band a good opportunity to stretch. Morse then revisits some musical themes throughout the last four minutes of this song, and Mike Portnoy finally gets his chance to cut loose and makes the most of it. This song then winds down to a cello and double bass. Another slow number, this turns up the gospel element in the end with the overlaying vocals. The soft mood continues for a bit, but then things get brought up slightly - this instrumental acts as a final movement to this suite. This is a short (1:05) instrumental that employs the string section with a trumpet leading the call, all in a bright 6/8 time. A mid-tempo rocker here, but Morse calls "Rejoice" like he's standing on a mountain top, Pamela Ward and Aaron Marshall add backing vocals, and Portnoy's cymbal crashing adds to the celebratory mood. Things start to wind down with this tune that starts around a beautiful four-chord progression and then varies from there. The string section adds a wonderful color to this track. And so we end where we began. This coda has Neal on electric piano and whispery vocals and at 53 seconds is properly understated.